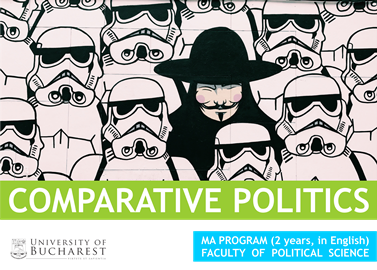 The two-year master program in comparative politics taught in English at the Political Science Faculty of the University of Bucharest is among the very few of its kind in Central, Eastern, and South-East Europe. The program provides students with an intellectually stimulating analysis of the key issues in regional and European politics, such as the changing dynamics of state power, the dimensions of regime change, and the challenge posed to states by ethno-nationalism and political radicalisms. The program is on track to become of the elite graduate programs of the University of Bucharest in terms of internationalization and EU academic exchanges. A wide range of academic and institutional partnerships ensure enhanced professional skills for prospective students. Our curriculum stresses both the theoretical and empirical dimensions related to the modern and contemporary evolution of politics and society in the region. The program is methodologically eclectic yet rigorous, with an emphasis on historical and political science approaches. The program offers courses in the fields of democratization, nationalism and ethnicity, political elites and institutions, and constitutionalism. These processes are analyzed as embedded in their area- and country-specific particularities and contexts. The program looks for sophisticated analytical answers to such basic political questions as: 'why are some countries democratic while others are not?' 'why are some countries torn by ethnic conflict?' 'do constitutions matter?' 'what is the impact of global capitalism on state sovereignty?' At the same time, the comparative perspective is deeply embedded both in the curricula and in the overall direction of the program. The master program is meant for students with a BA degree (180 ECTS) in political science, history, sociology, law, economics, philosophy, and philology, coming from Romania, Central and South-East Europe, EU and Non-EU countries. Students, many of them international and exchange, take part in small graduate seminars and thus benefit from the direct guidance of the professorial body. The faculty/student ratio (currently approximately 1:3) meets the most demanding standards of higher education. Courses will be taught by academics with solid credentials in their respective fields of expertise; all faculty members have had extensive exposure to the international academic world. With this Master program the graduates will be well prepared for various jobs opportunities requiring an in-depth knowledge of the political, economic and social issues at stake in Central and Eastern European Countries. The Master program prepares students for careers in academia, enterprises, public bodies, think thanks, NGOs, foundations, media, EU institutions and international organizations. Most of our graduates succeeded in their pursuit for a successful career in a wide range of public and private institutions, in Romania and abroad.